If you crave the sight of superheroes bashing apart robots then Avengers: Age of Ultron will not disappoint. Within these glossy 141 minutes an armada of CG robots are beheaded, exploded, sliced apart, crushed, electrified, melted and disarticulated. Buildings are reduced to rubble, cars are tossed about, extras run every which way screaming and gigantic floating ships buzz around in the sky. Everything is happening at once! But also, puzzlingly, nothing is happening. 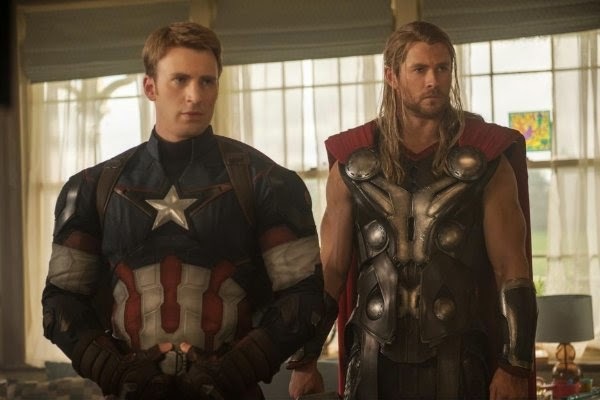 The film continues right where Avengers Assemble left off with our heroes mopping up the dangling plotlines of that film. After that in the mood for celebration; but these spirits are dampened when Tony Stark (Robert Downey Jr) accidentally creates Ultron (James Spader) an evil robot that wants to wipe out humanity. The rest of the film involves the familiar faces of Captain America (Chris Evans), Thor (Lia, Hemsworth), Black Widow (Scarlett Johansson), Hawkeye (Jeremy Renner) and the Hulk (Mark Ruffalo) tracking down Ultron and foiling his nefarious scheme. 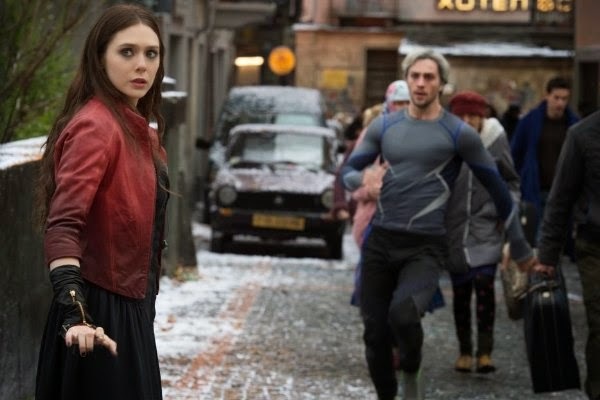 Along the way they pick up a couple of new recruits, the Maximoff twins Wanda (Elizabeth Olsen) and Pietro (Aaron Taylor-Johnson), and zen robot Superman-a-like The Vision (Paul Bettany). Rounding out the cast are a smattering of supporting characters from the Marvel franchise and a couple of character actors who look happy to collect a paycheque. What's most vexing about Age of Ultron is that there's nothing thunderingly wrong with it. The action is competently shot, the script gets to the point with a minimum of fuss and there's a big action scene about every half an hour. Joss Whedon has delivered a summer superhero blockbuster that ticks every box required of it. I've always approached criticism on the maxim that I'd much rather watch an interesting failure than successful mediocrity, but the latter describes Age of Ultron to a tee. Part of the problem is that, very quickly, the film defines itself as an interstitial chapter leading up to the future Thanos/Infinity Gauntlet films. Entire scenes are devoted to setting up this future threat, leaving us in no doubt that the 'real' peril is still to come. The consequence of this is that the narrative we're actually watching feels increasingly sidelined. This also means the tug towards the status quo is irresistible to the point where, as the credits roll, we are almost in precisely the same place as we began. This applies to the increasingly repetitive character arcs as well; so the Hulk learns to control his rage a bit more, Black Widow comes to terms with her history a bit more, Captain America gets over the past a bit more and Thor worries about Asgard a bit more. Theis repetition is especially egregious in Tony Stark, who by my count for the fifth time in a row learns an important lesson about hubris. Maybe this time it'll stick, but given his vaunted presence in the upcoming Captain America: Civil War I'm guessing probably not. That lack of forward momentum even extends to developments within the movie. The crowning moment of the trailers for this film is the promise of an upgraded 'heavy' Iron Man duking it out with the Hulk. This fight plays out exactly as loudly as you'd expect, the destruction broadly quoting the climactic scenes of Man of Steel. Problem is, the fight is of so little consequence to the plot that it could be cut from the film with little to no impact to the narrative. It's an action sequence for the sake of an action sequence in a film that exists because an Avengers movie was scheduled for 2015. Even a contractual obligation with hooks for future instalments dug into it like ticks could say something with it's narrative. Age of Ultron doesn't. In fact it almost aggressively resists being about anything. The closest we get is a repeated motif where the characters idly ponder whether they're monsters or not, complete with a couple of basic visual references from Frankenstein. Symbolically it's about as deep as a puddle, believe me I tried to find something to grip onto here - but that's the best I could manage. Pressed for something to recommend, I enjoyed James Spader's villainous turn as Ultron, who reminded me of a somewhat toned down version of Bender from Futurama. Rarely have I seen such a moustache-twirlingly evil robot on screen. Sure his motivations and intentions are kinda confusing, but he's never less than amusing to watch, dancing around the frowning superheroes like an refugee Disney villain. That's about all there is to say about this. There's a crushing inevitability to Age of Ultron. It will make a ridiculous amount of money. It will be hoovered up by mewling nerds who're happy with watching things happen. It will successfully spawn sequels ad nauseum. Honestly, it's a dull and pointless experience and you shouldn't bother with it. But come on, let's not kid ourselves. You'll go anyway. Avengers: Age of Ultron is released 24th April.